Last spring, two University of Iowa graduate students in the Department of History interviewed seven Iowa City residents from Sudan to document their personal stories and perspectives. UI alumna Margot Connolly then turned those oral histories, along with content from the book Modern Muslims: a Sudan Memoir by Steve Howard, into a play. Now four University of Iowa acting students are performing the work, directed by UI theatre graduate student and actor in the play, Britny Horton. Join us for the premeire staged reading of "My Daughters are My Writings," followed by a talk given by author Steve Howard and a reception. This event is free and open to the public. 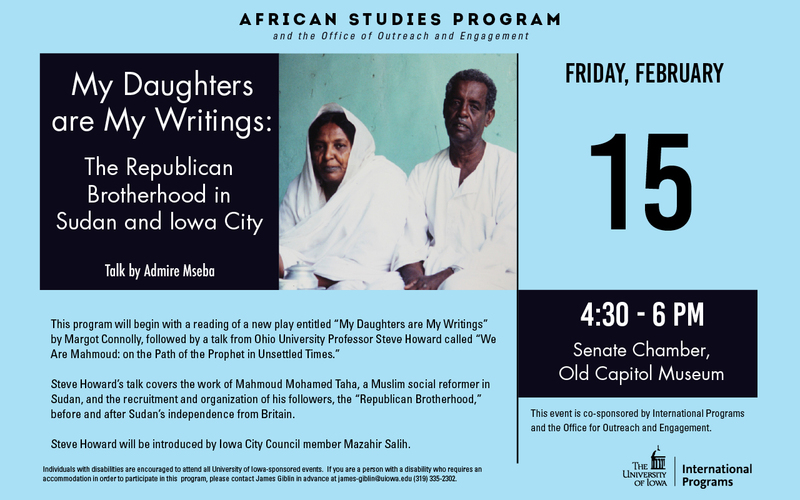 Presented by University of Iowa African Studies Program and the Office of Outreach and Engagement.